A superb introduction to the Trois Rivères range. Cuvée du Moulin translates as “type of the mill” and presumably refers to the sugar mills used to juice the cane (a windmill features on the bottle’s label). 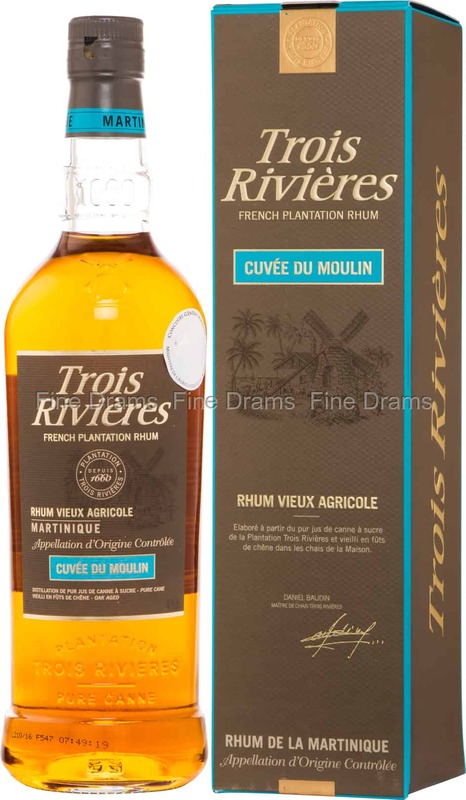 Trois Rivères are one of the finest producers of the Rhum Agricole style, partly because they possess an excellent geographic location for the cultivation of sugar cane. The distillery’s plantation is found in the deep south of Martinique, where the cane crops grow in magnesium rich soil, whilst their roots sit in sea water. This produces a sugar cane full of character, and ideal for the creation of fine Rhum Agricole. This bottling is an excellent example of such a rum. Cuvée du Moulin has been aged in a mixture of former Cognac and Bourbon casks for other three years, producing a spirit rich in complex flavours. Cuvée du Moulin serves up notes of wood spice, dried fruits, white grapes, old oak, leather, vanilla custard, caramel, allspice, apples, juicy citrus, and some grassy cane. A top quality Rhum Agricole, that will appeal to drinkers of Cognac and single malt whiskies.